Charles C. Brennan is the creator of the Brennan Rock & Roll Academy, a music education nonprofit in Sioux Falls, S.D. Charles C. Brennan, owner of Las Vegas-based Dollar Loan Center, answers questions about the 2013 “Dad’s Rock” block party and explains exciting gift ideas for the wanna-be rocker. Q: When was the “Dad’s Rock” block party? Charles C. Brennan: Father’s Day, June 15, at noon in cooperation with KOMP 92.3. Q: Where was the event held? Charles C. Brennan: At the Rock ’n’ Roll Fantasy Camp in Las Vegas, Nevada. Q: Aside from music, what attractions were available? Charles C. Brennan: Participants were treated to a number of different food vendors, a car show, guided tours of the facility, live music and giveaways. Q: Were any celebrities in attendance? Q: What opportunities are available at the Rock ’n’ Roll Fantasy Camp? Charles C. Brennan: The camp offers four custom-designed experiences including destination camps, Rock Camp 101, Rock Star for a Day, and corporate teambuilding. Q: What is Rock Camp 101? 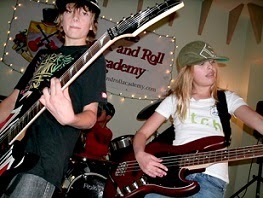 Charles C. Brennan: This is a two-day, hands-on rock camp that teaches students how to master an instrument and offers lessons on vocals, songwriting, the technical and business aspects of music, and tips on getting over stage fright. Q: How much does Rock Camp 101 cost? Charles C. Brennan: Currently the cost is $1,699 and is held in Las Vegas. Q: What’s an option for those who don’t have two days to spare? Charles C. Brennan: Rock Star for a Day offers five different options. They are all completed within one day with prices starting at less than $300. Q: What are the different packages? Charles C. Brennan: The Jam Package includes a 90-minute studio session and an intimate jam session with a professional musician. Q: And for those who want more? Charles C. Brennan: The Band, Rock Star, or Arena Tour Package offer a lengthier rock star experience. The Arena Tour Package includes car service, a three-hour session with three touring musicians, an autographed guitar, and a voucher toward a future Rock ’n’ Roll Fantasy Camp. Q: What group options are available? Charles C. Brennan: Rock Camp in Las Vegas offers a stadium tour package that allows up to 25 people to enjoy the Rock Star for a Day experience. Q: Where are the Rock ’n’ Roll Fantasy Camp studios located? Charles C. Brennan: Just west of the Las Vegas strip. Q: What benefits does the corporate camp offer? Charles C. Brennan: The corporate teambuilding experience encourages groups to use critical thinking and problem-solving skills through music. Options range from two to 10 hours and are fully customizable. Charles C. Brennan lives in Las Vegas, Nevada, and owns Dollar Loan Center. He is an avid music enthusiast and is known throughout Las Vegas for his charitable contributions to teens by offering the power of music education. Charles C. Brennan is a successful entrepreneur and businessman based in Las Vegas, Nevada who is originally from Sioux Falls, S.D. Brennan founded and serves as CEO of Dollar Loan Center, a short-term lender based in Nevada, his current home state and base of operations since 1996. Charles C. Brennan is also the co-founder, with his wife, of Clark County Collection Service, LLC, and creator of the Brennan Rock & Roll Academy, a music education nonprofit in Sioux Falls, S.D. LAS VEGAS, Nevada – August 19, 2013 – Charles C. Brennan reports that a private airplane transporting ’80s rock bands Dokken and Ratt had to make an emergency landing in northwest Illinois after smoke was spotted in the plane’s cabin. The flight, which was scheduled for August 17, 2013, out of Moline, Illinois, was chartered by Charles C. Brennan, entrepreneur and founder of Dollar Loan Center based in Las Vegas, Nevada. According to Charles C. Brennan, the bands were scheduled for a mini tour and were en route to the Chicago area after playing in Moline with Lita Ford and Sebastian Bach. © COPYRIGHT 2013. Charles C. Brennan. ALL RIGHTS RESERVED. Simple theme. Powered by Blogger.